This post and recipe was created for #HalloweenTreatsWeek. I was sent samples by some of the sponsor companies but as always opinions are 100% mine. 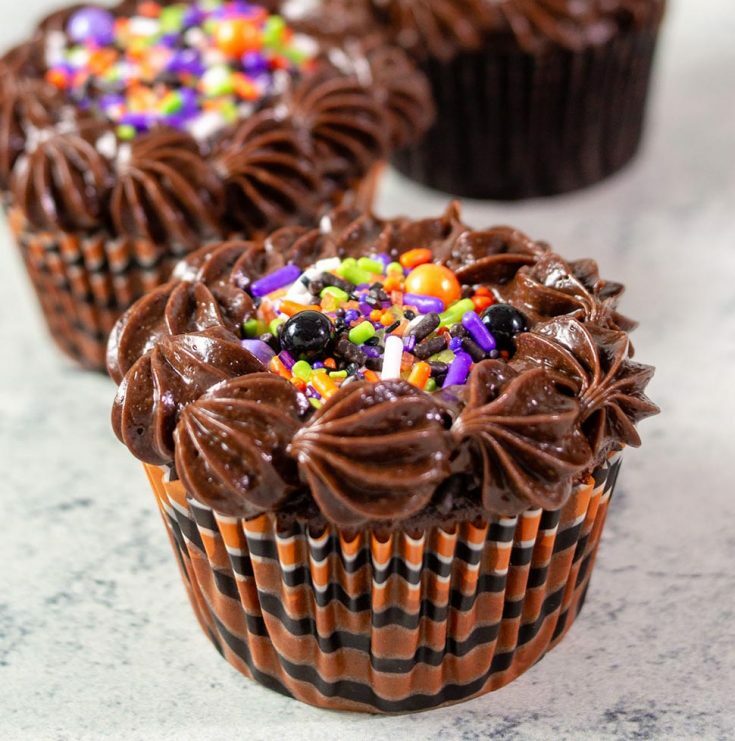 Turn cupcakes into Cauldron Cakes for Halloween! 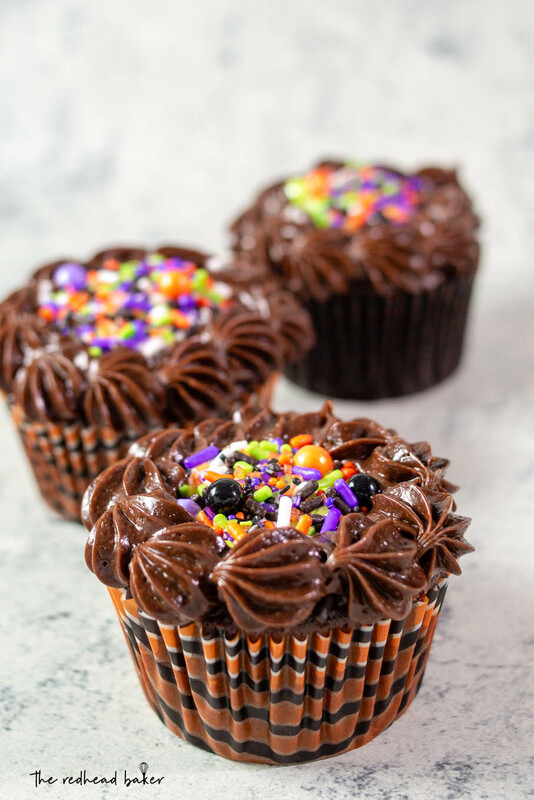 Chocolate cupcakes are the base for a marshmallow potion, and Sweets & Treats sprinkles bubble out of the top. 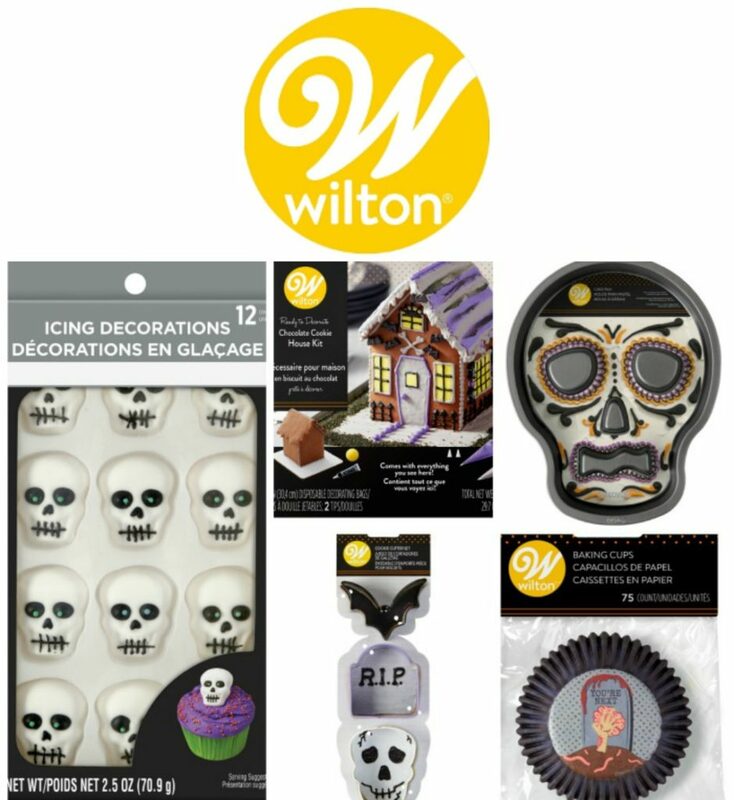 I hope these spooky sweets and treats are getting you into the Halloween mood! 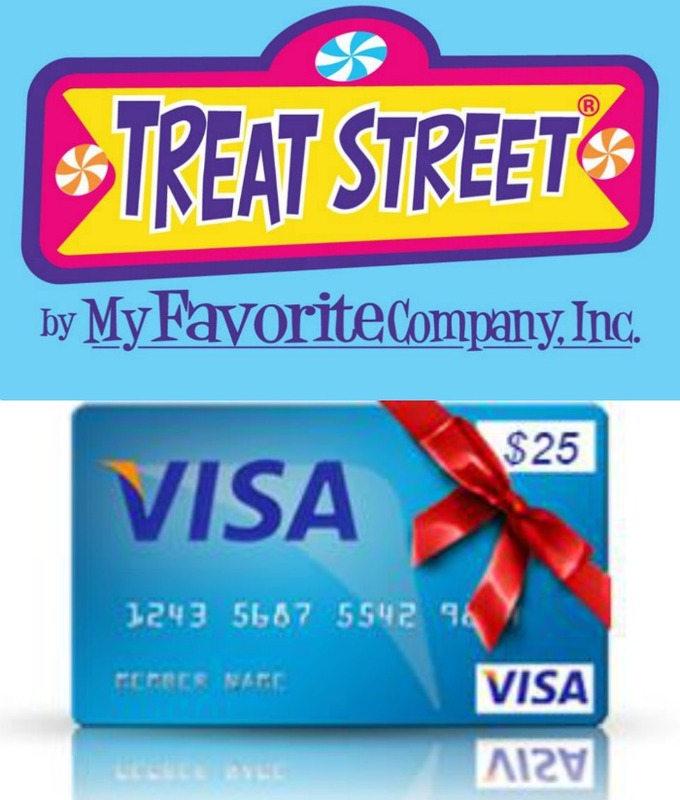 Don’t forget to enter the giveaway! Prize info and giveaway entry form are at the bottom of this post. When I think of Halloween, one of the classic symbols is a witch. Witch decorations, witch costumes, etc.! So, why not witchy treats? 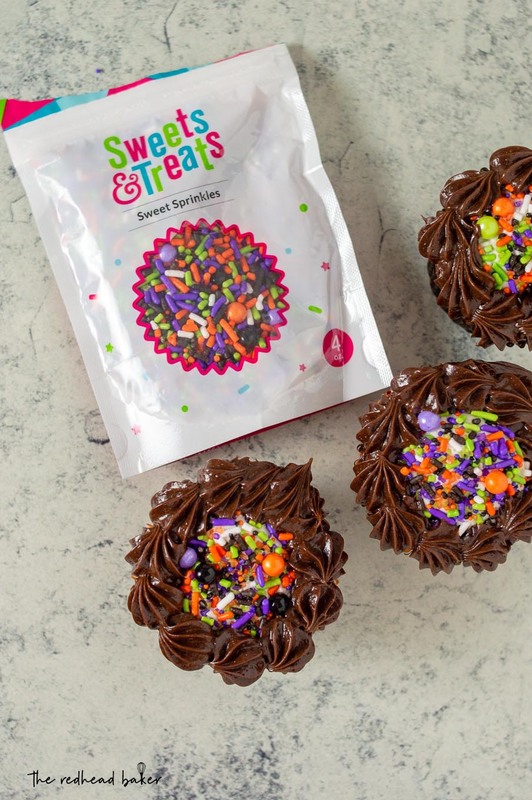 I turned ordinary chocolate cupcakes into cauldron cakes with the help of Sweets & Treats Boutique‘s sprinkle mix. When I was considering how to construct these cauldron cakes, I was originally going to frost them, then add the sprinkles. But, they wouldn’t resemble cauldrons at all. Just cupcakes with sprinkles. Then I found a tutorial from Pastry Affair, and while they look AWESOME (seriously, go check them out! ), they are a lot of work. And since the cauldron handles aren’t made with tempered chocolate, they wouldn’t maintain their shape after a while. So, I simplified mine a bit. I loved the idea of filling them with yummy marshmallow cream to help the sprinkles adhere. But after that, I simply added some dollops of chocolate frosting around the edges for a rim. I really doubt my 6-year-old would appreciate the time and effort of making cauldron feet out of chocolate chips. My favorite part of these cauldron cakes the sprinkles bubbling out of the top of the “cauldrons.” I love the “Monster Mash” sprinkle mix I got from Sweets & Treats. I’ve been a fan of theirs for years, and I’ve used their paper straws and cupcake liners in past posts. 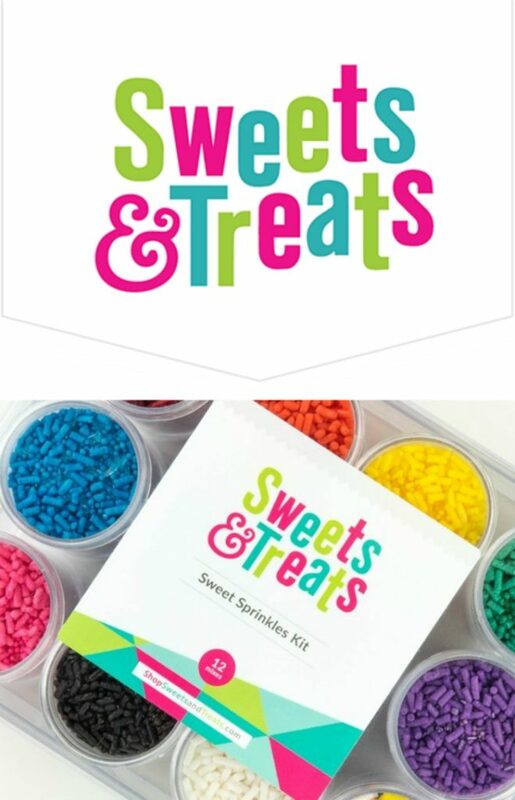 Their pre-made sprinkle mixes come in all sorts of creative themes! If you don’t see a pre-made mix that works for you, you can even create your own. 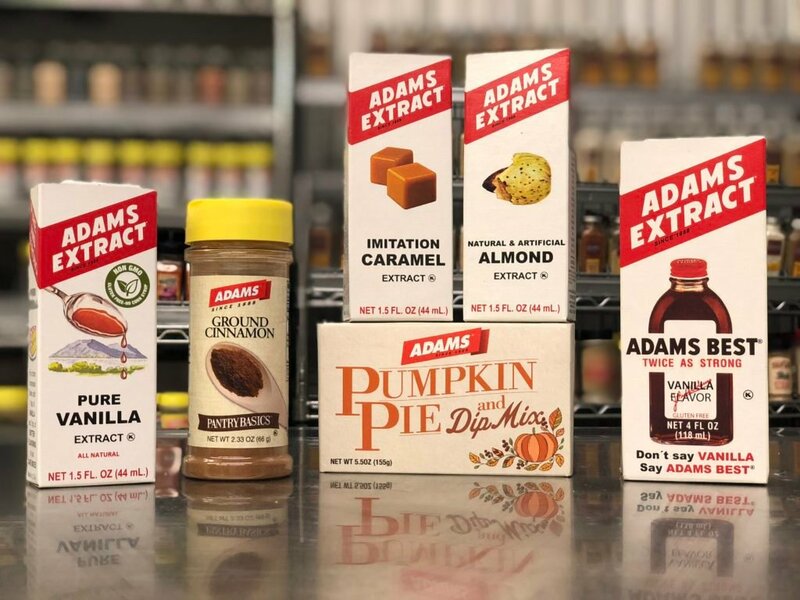 They have sprinkle options that are vegetarian, vegan, gluten-free, dairy-free, or nut-free, and they have tags under Allergy Info in their menu, so you can easily find sprinkles that are safe for your dietary needs. 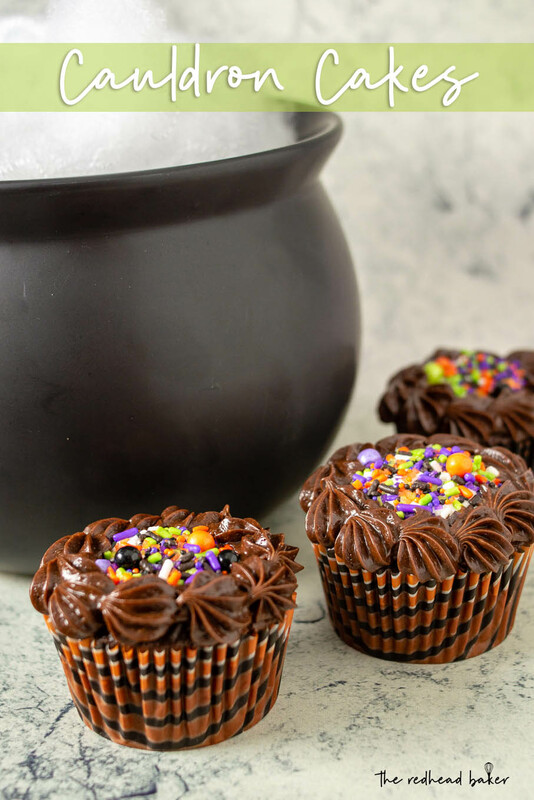 Turn cupcakes into Cauldron Cakes for Halloween! Chocolate cupcakes are the base for a marshmallow potion, and Sweets & Treats sprinkles bubble out the top. Preheat the oven to 350°F (177°C). Line a 12-cup muffin pan with cupcake liners. Set aside. In a medium bowl, whisk the eggs, granulated sugar, brown sugar, oil, and vanilla together until completely smooth. Pour half of the wet ingredients into the dry ingredients. Then half of the buttermilk. Gently whisk for a few seconds. Repeat with the remaining wet ingredients and buttermilk. Stir until *just* combined; do not overmix. The batter will be thin. Pour or spoon the batter into the liners. Fill only halfway to avoid spilling over the sides or sinking in the middle. Bake for 18-21 minutes, or until a toothpick inserted in the center comes out clean. Remove to a wire rack to cool completely. In a medium bowl, beat together the marshmallow fluff, shortening, sugar, and vanilla extract until light and fluffy, about 3-5 minutes. Transfer to a piping bag and set aside. Melt the chocolate in a heat-proof bowl set over a pot of simmering water. Set aside to cool until just barely warm. In the bowl of a stand mixer fitted with the paddle attachment, beat the cream cheese and butter on medium-high speed until pale and fluffy, about 3-4 minutes. Gradually mix in the confectioners’ sugar, cocoa powder and salt. Beat in the melted and cooled chocolate and then the sour cream. Continue beating until the mixture is smooth and well blended. Transfer to a piping bag fitted with a small open star tip and set aside. Pour the sprinkles into a small bowl. 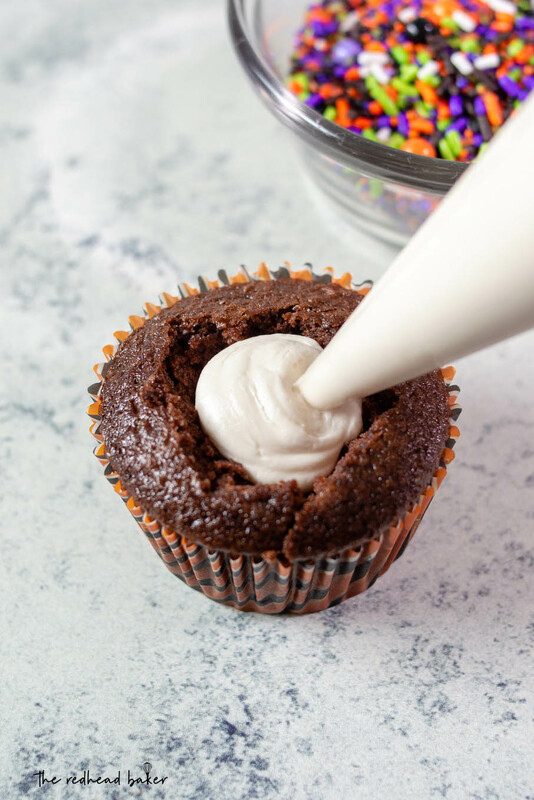 Using a sharp paring knife, cut a cone-shaped portion out of the middle of each cupcake. Do not cut all the way down to the bottom. Snip off about a quarter inch of the piping bag with the marshmallow cream, and pipe some of the cream into the hole, filling it just above the top of the cupcake. Dunk the top of the cupcake into the sprinkles until some adhere to the marshmallow filling. Set aside. 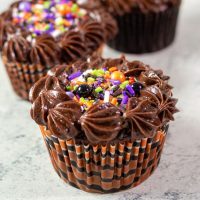 Once all cupcakes are filled and sprinkled, use the piping bag of chocolate frosting to pipe small dollops around the edges of the cupcakes to make the rim of the cauldron. Store in airtight containers in the refrigerator until ready to serve. The Nightmare on Elm Street franchise was my first exposure as a kid to horror movies, so I think Freddy Krueger would be my favorite Halloween character. I used to have a life sized cardboard cutout. I love caramel and candy apples! These are just so cute! I didn’t realize they were filled with marshmallow cream. Yum!! I love the nested goodies in these. So cute! These are super cute! I have the same sprinkle mix. I might have to bake and take for Halloween.